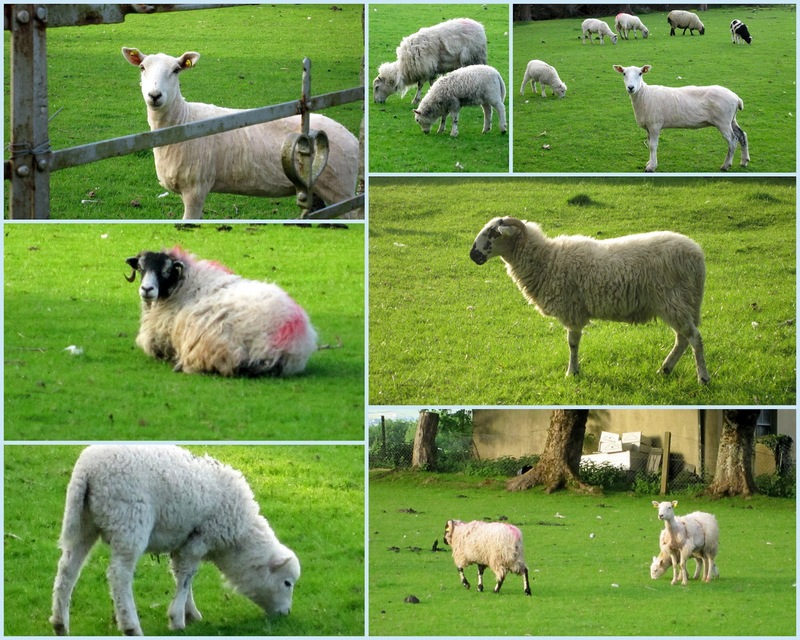 You might want to read Part 1 and Part 2 of my Ireland vacation prior to reading this post! On Thursday Cathy, Allan and I set off for the Ring of Kerry. 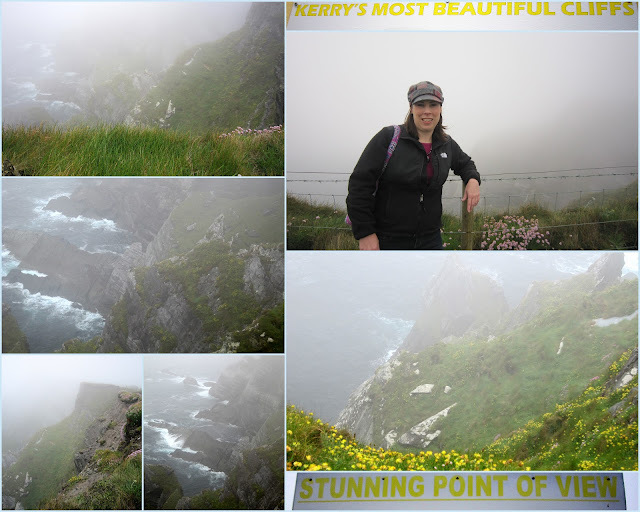 We had hoped to go to the Skellig Islands but as you can see from the pictures it was super foggy that day and we didn't think it would be worth it due to poor visibility. So instead we explore the Ring! Our first stop on the Ring was in Portmagee to have a late morning snack at The Bridge Bar. It was a really cute place right on the water (and I may have eaten the best croissant I've ever had)! 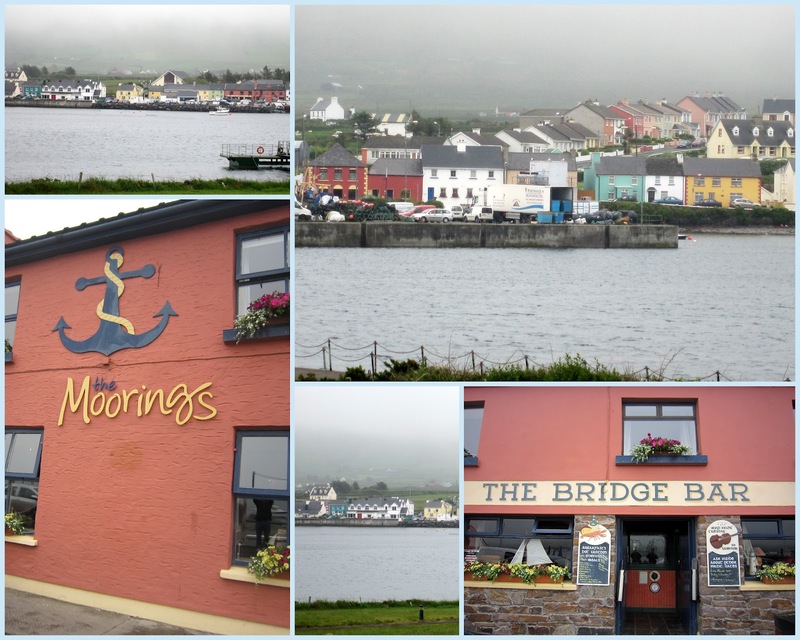 Even in foggy weather Portmagee still looked so pretty. 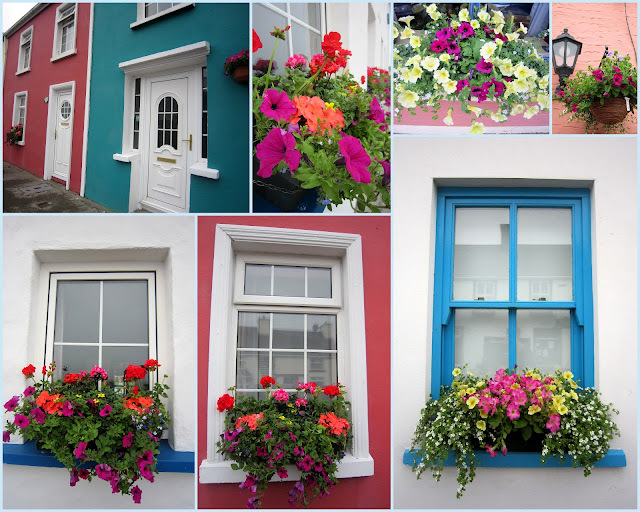 I love all the flower boxes on the windows and the bright colors they use to paint their houses! As we were driving The Skellig Ring we kept seeing signs that said things like "Kerry's Most Specular Cliffs" and we knew we couldn't miss that. Haha! Even in terrible weather the cliffs were amazing! I would have loved to see them on a clear day. 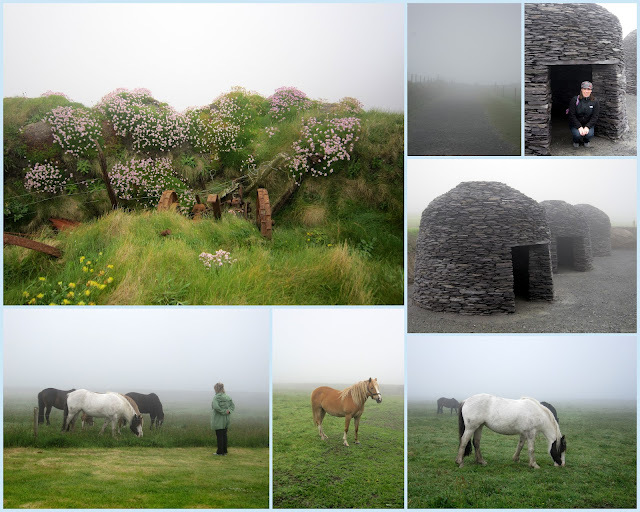 On our walk to the cliffs we got to check out some "bee hives" like the ones the Monks use to build and see some friendly horses! They didn't seem to mind the weather at all - I guess they are use to it. We left the cliffs with the plan to continue along the Skellig Ring to find "Skellig Chocolate" which we had heard about back at the pub. Unfortunately we got lost. Yes even though there are only two roads we managed to go the wrong one and therefore never passed the chocolate and missed out on the free tasting. I was pretty bummed but now we have something to do on a future trip! We got back on The Ring of Kerry road and made our way to Waterville. I've been to Waterville before but it was nice to visit again. Our first stop was at Waterville Golf Club so Allan could check it out. He and Cathy had planned to golf there but that all changed of course due to his injuries. The "required" pictures of Cathy and famous golfer Payne Stewart was taken! Allan refused to pose for one - no surprise there. Believe it or not there were tons of people golfing even though the weather was gross. Again, I guess the Irish are use to it! After the stop at the golf course we made our way into town and it was my turn for a "required" picture with Charlie Chaplin. There is a statue of him b/c he use to vacation in Waterville. We had lunch at a pub that even had my last name. I'm guessing one of my very distant cousins owns this place! We then started our journey back to Killarney. Driving the Ring of Kerry is not easy but the views make it so worth it. The fog didn't help the driving conditions but my aunt did a great job! Luckily the road wasn't too busy - I'm guessing there were less people on the Ring since the weather was bad. On Friday my mom and I went horseback riding. 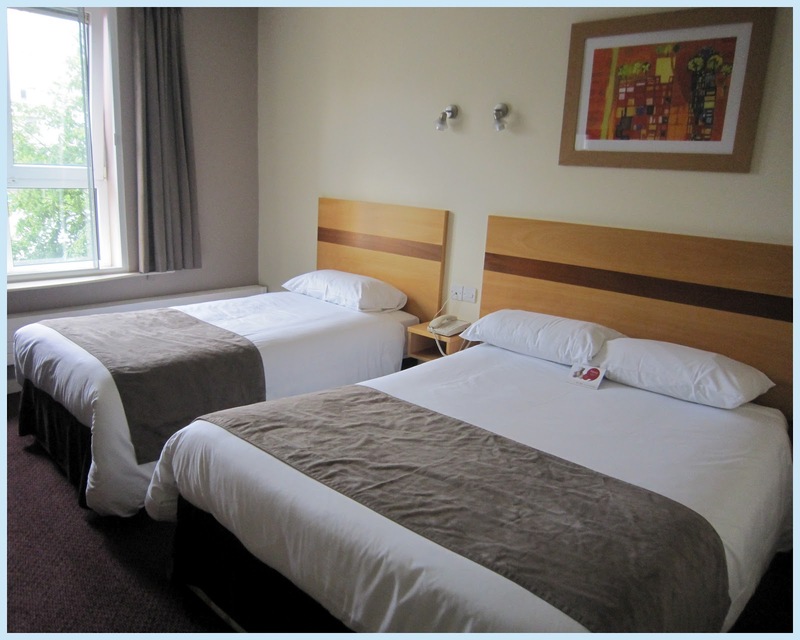 We are lucky that are cottage in just a couple of miles from an excellent riding place, Killarney Riding Stables. We had been there before - during out trip 3 years ago. Since it wasn't busy the two of us had a "private" ride with the two guides. It was really nice. Of course I got a horse that loves to eat and took every chance he could get to go for some grass. 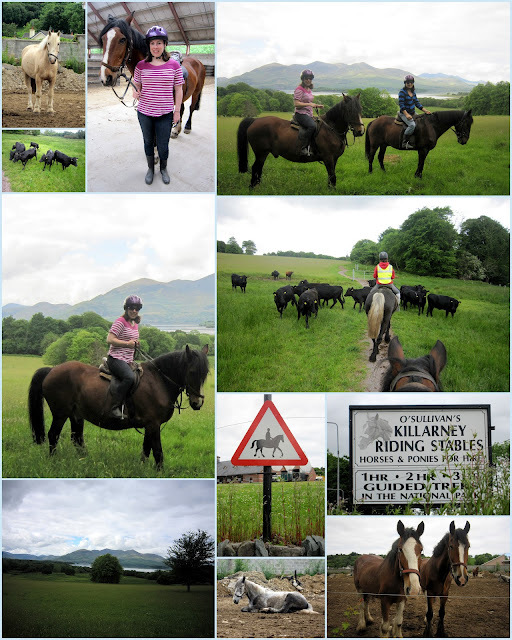 The ride took us through Killarney National Park which is so pretty and peaceful. We had a bit of a situation. . . a roadblock if you will. This herd of black cows would not get off the trail! It was pretty funny especially b/c the horses didn't like them at all! Friday night was our last night in Killarney so we went to a "fancy" restaurant! Bricin is a nice place - more upscale than a pub and we had gone during our last trip too. 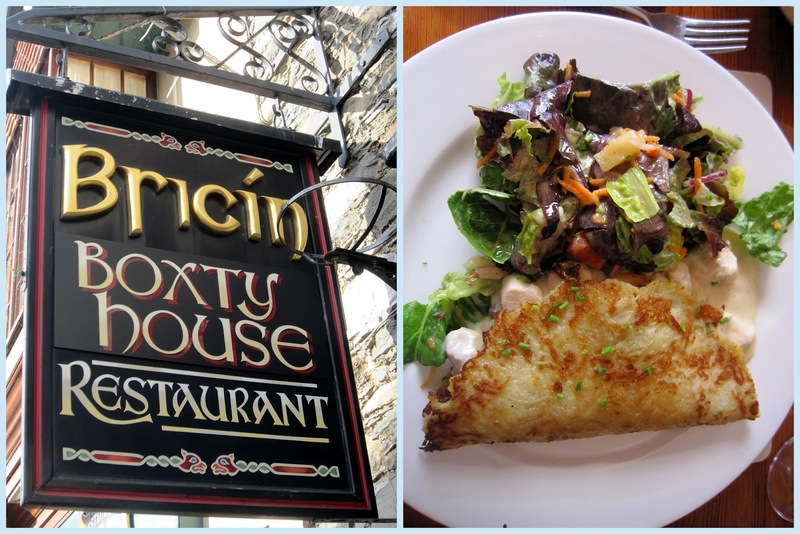 They are famous for their "boxty" which is a traditional Irish dish (aka another way to use potatoes in a meal). It taste like a chicken pot pie and is basically a potato pancake with chicken and veggies in it. So good! I highly recommend visiting this restaurant if you are ever in Killarney. It is a nice break from all the pub food! After dinner we took a drive to a nearby "village" for drinks. On our way we went past a farm with these sheep so of course we had to stop! They are really skittish and did not like me getting too close. The baby with the mother was so cute! 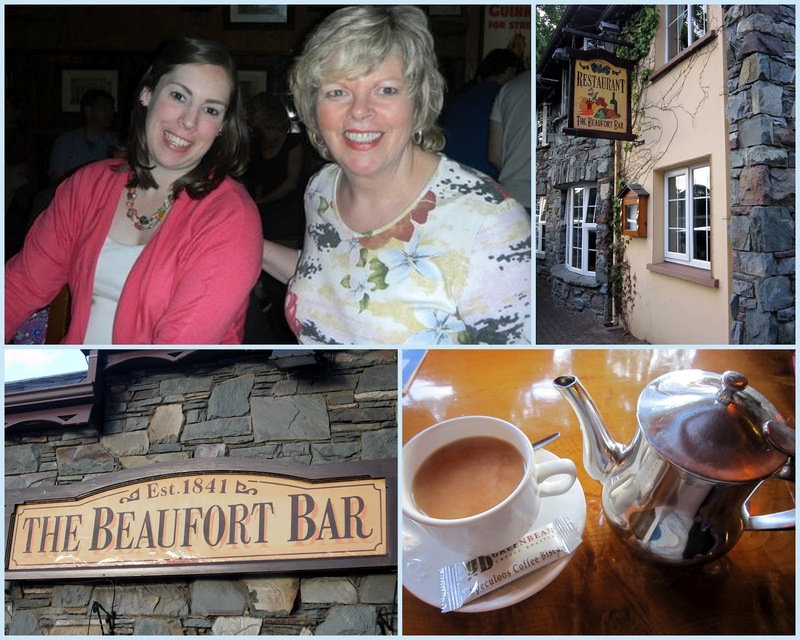 We went to The Beaufort Bar because Cathy says it is the best Irish Coffee she has had! I'll take her word for it. I had tea!! Saturday morning we were up early to pack up and head to Galway. On the way we made a stop in a town called Athenry . My maternal great great grandmother, Theresa Kelly was born in this town so we wanted to check it out. 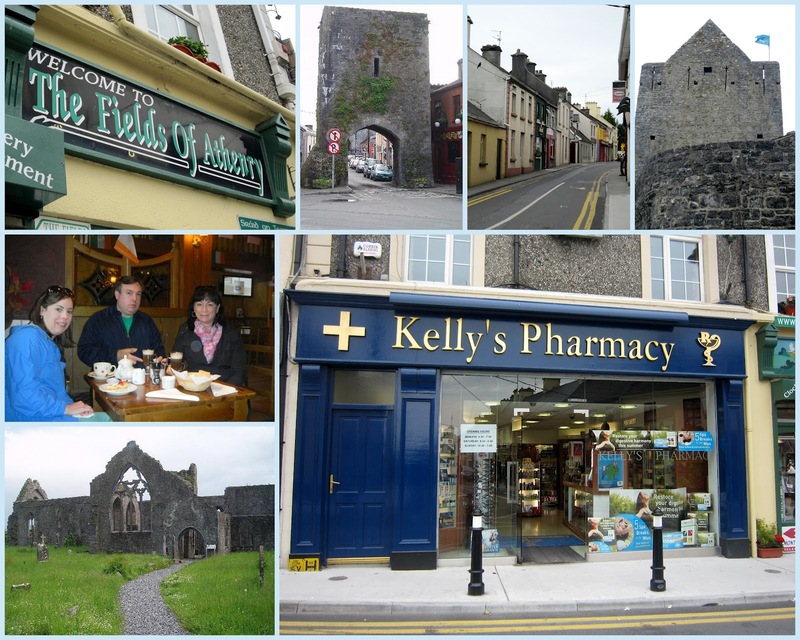 To our surprise there was a pharmacy called Kelly's! The town is very cute and has some beautiful ruins including a church and castle. We continued on to Galway and checked into our hotel, Jury's. This is located is a great spot right at the end of the main shopping/pub street! Of course it was raining (it rains a lot in Galway) so we go our rain jackets and headed out. 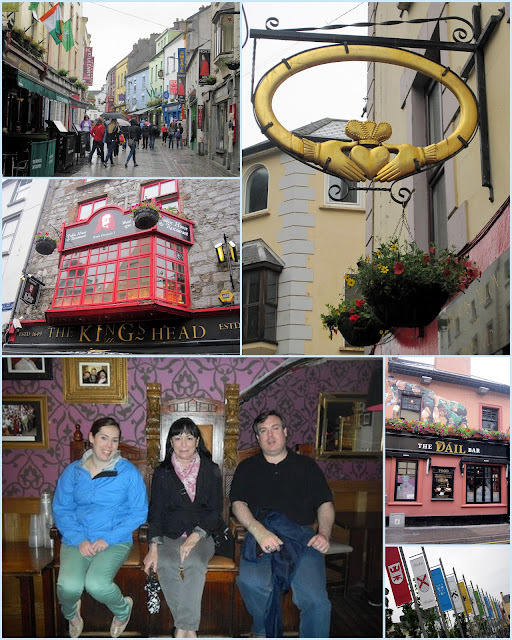 . .
Galway is a "college town" and has a lot of fun pubs. And what do you do in the rain. . . well go to pubs of course! We made our own "pub crawl" and checked out a few of the most popular spots in town! We had dinner at another popular pub, The Quays. It has pieces in it that were imported from a church including beautiful stained glass windows. 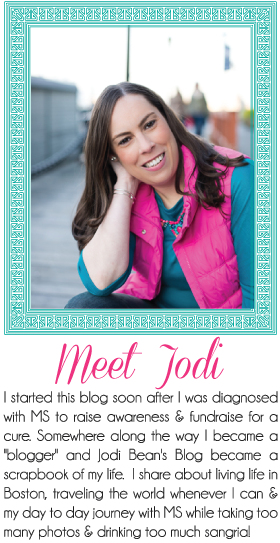 Definitely worth checking out if you ever have the chance! 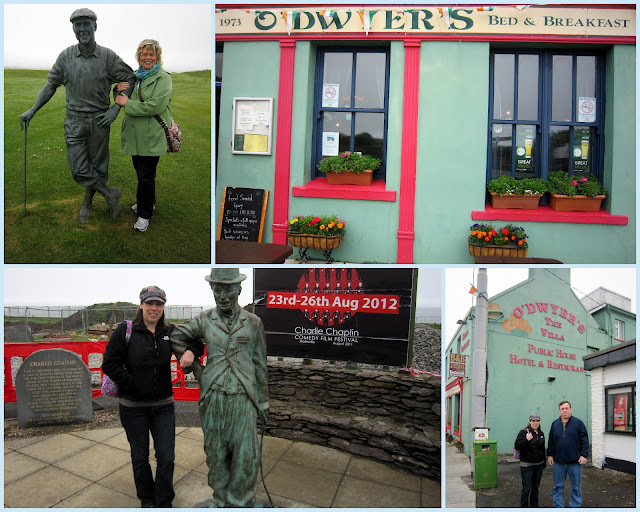 Both times we've visited Galway it has been raining. Not sure I need to go back unless I know it will be sunny! Ha! Sunday morning we were up and out to head to the airport. Another amazing trip came to an end! 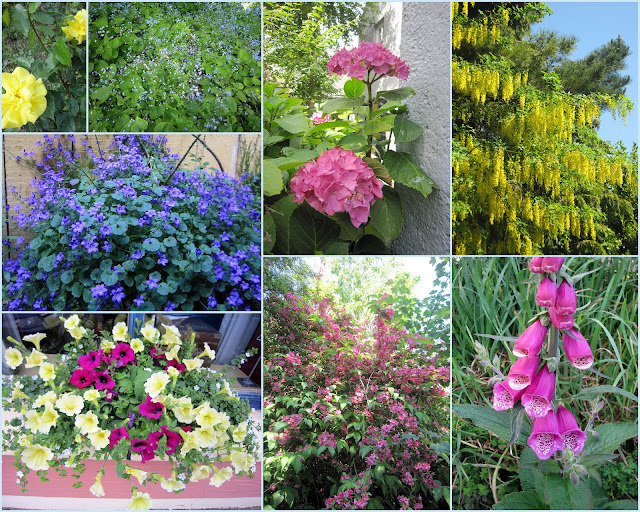 Since I don't want to end this post on a "rainy" note I thought I would post some of my favorite Irish flowers pictures. The good thing about all the rain is that it makes beautiful flowers! I hope you've enjoyed reading about my vacation to Ireland. It is a beautiful country and I would highly recommend a visit if you ever have a chance. This is the 3rd and final part but I will share some iPhone pics and pics of what I bought next week! Okay seriously-- when people talk about Ireland, I usually only picture green rolling hills, a smattering of castles in the middle of nowhere and some pubs. But these recaps and pics are actually convincing me that it would not be a boring place to visit and that there's actually stuff to see/do!! Lol.